A home exploded Sunday at 436 Pleasant Ave. in Michigan City. Crews respond to the scene of a gas explosion that destroyed a home Sunday in Michigan City. 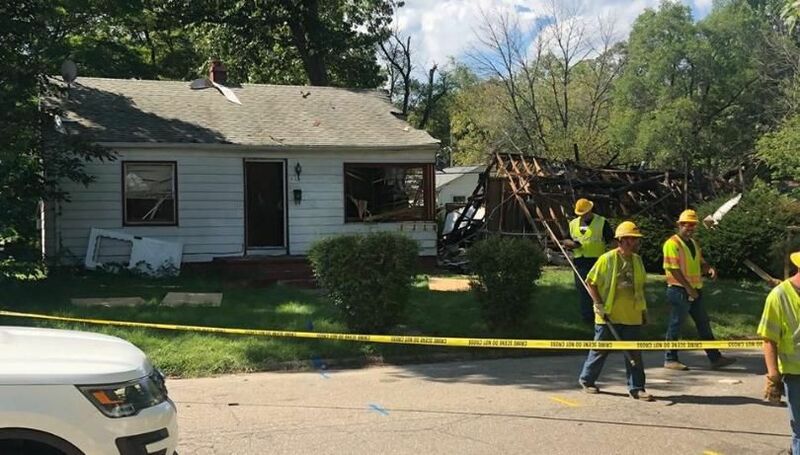 A house exploded Sunday morning in Michigan City, but no one was inside and there were no injuries. At around 9:15 a.m., the Michigan City Fire Department responded to a call of a residence on fire from a possible explosion in the 400 block of Pleasant Avenue, according to a news release. Firefighters determined the residence was on fire as was the home next door. They found that the first house had collapsed, the roof was on the ground and debris was scattered all over the neighborhood. The home was vacant. Firefighters put out the blazes promptly. "We are very lucky that this incident happened early Sunday morning as no one was out and about in the neighborhood," stated Michigan City Fire Chief Randy Novak. "The area is a heavy populated residential area with children and many residents typically outside." The blast blew out windows on cars and residences up to a block away, and caused structural damage to adjacent homes. A NIPSCO spokesperson said it was a gas explosion. The cause is still under investigation, which is being conducted by the Michigan City Fire Department, state fire marshal’s office, NIPSCO fire investigator, the Michigan City Police Department, and the Bureau of Alcohol, Tobacco, Firearms and Explosives. Also on the scene were the American Red Cross, Emergency Management Agency, Michigan City Refuse and Street Department and Michigan City Inspection Department. VALPARAISO — A 33-year-old Valparaiso-area man is accused of sexually abusing a girl nearly every day for years since she was 9, according to police. A car crashed through a family home in Portage Township, nearly plowing into a sleeping boy in his room, police reports and the boy's mother said. CROWN POINT — A 64-year-old man is charged with sexually assaulting a girl beginning when she was 8 years old at his residence in Lake Station. PORTER — Police say an 65-year-old man at a bar sexually battered a woman three times Wednesday. GRIFFITH — Police are following up on leads after several burglaries and attempted burglaries, an official said. HOBART — Police on Thursday released surveillance images of a woman who may be linked to a case in which a man was defrauded of more than $2,000. UPDATE: Police: Drug-using father of drowned children resigned to fate. ‘A pair of hands and a pair of knees sticking up from the water,’ a witness said of the scene. Court records released Thursday paint the father of two boys who drowned in the Kankakee River on Tuesday as a man resigned to his fate. While conducting raids Tuesday in Gary, a Drug Enforcement Administration agent shot a dog at one of the residences. Hobart scored 14 points in the third quarter and hung on late for a 21-20 win over LaPorte. If you're a fan of the History Channel's "American Pickers" you'll be interested to know the show will be coming to Indiana sometime in October. Amanda Lyn (Diehl) Borgia filled the lives of those around her with love, light, warmth and joy. MUNSTER — For most people, retirement is a chance for rest and relaxation, a respite from decades of labor.